If when you think about winter, your mind turns to thoughts of staying indoors and hibernating, you’ve got it all wrong! Instead of lamenting the loss of warm weather and flip flops, look at the opportunities that winter affords. Snow, ice and dark evenings CAN be your friends. No, really! The key to becoming a ‘winter person’ is to be well covered. Snow pants, boots, warm coat, hat, mittens… the works. If you’re well dressed, you’ll be comfortable no matter what the weather is throwing at you. Once properly dressed, you can go out and enjoy so many activities that just aren’t available to you in July. Like what? Ice skating – whether on a canal or pond, or at an artificial rink, ice skating is good exercise and great fun for the whole family. Skiing – cross country or downhill, you pick! Or maybe this is the year you’re finally going to learn to snowboard? Strapping on the boards and getting out into nature is a great way to relieve some stress. How about ice fishing? That’s a winter tradition that is worth exploring, even if only so you can say that the big one got away! If your family enjoys fishing in the summer, this is a fun way to keep it up, all winter long. Dog sledding: this unique winter activity is something everyone should try at least once! The speed, the rush, it’s an experience with no compare. Snowshoeing – a great way to enjoy the peace and quiet of a park or forest and get some exercise, in the bargain. Work off a little of that Christmas dinner while listening to the winter birds chirp. Do a polar plunge! Charities all over have embraced this idea and it’s an invigorating way to start your new year! Make sure someone is on shore to get some pictures because you’ll probably never believe you did it otherwise! Set up the EPIC snowball fight of all times with the neighbours kids and yours. Build walls, make dozens of snow balls, suit up and away you go! What about building a snowman, or even setting up a snowman building competition? Add in some old hats, scarves and a carrot nose or two. Whether you’re looking to build Olaf, or Frosty, it’s a fun time for everyone big and small. Tobogganing – find the biggest hill and go for it! Who cares if you look goofy flying down the hill? It’s all about discovering your inner child. If you can get out of town, why not try your hand at snowmobiling? Or if you’d rather keep it low key, just a walk in nature, with your camera. The sun glinting off the snow and the winter birds will make some beautiful landscape shots! Finally, plan a special winter escape: Skating on the Rideau Canal, meeting Bonhomme Carnaval at the Quebec Winter Carnival, sleeping in an ice hotel… Amazing opportunities that are only available in winter. Or how about swimming outdoors at a nordic spa? There are so many ways you can enjoy the winter weather. Have a PJ day, and stay comfy from morning to night. Read a book, cover to cover. How often do you have time for that? Bake cookies and sip mulled wine. Preferably at the same time! Make plans with friends you haven’t seen in awhile. The slower pace of winter is a great time to catch up over brunch, or even just coffee. Or mulled wine! Go through all of your old photos and organize them: you’ll probably be surprised by the treasures you’ll find. Plan a party! Even if there is no special occasion to mark, celebrate anyways! Invent your own winter wonderland reason for a festive event! However you choose to embrace the winter, finding the joy in it makes the whole experience more fun. These are all good ideas, especially ones that don’t cost anything. We had so much fun this winter – we hosted a friends’ christmas eve, a new years eve dinner, and then a birthday party for the 7 year old. Right now I’m more interested in the PJ day! I like the Bake cookies and sip mulled wine idea. I also like the stay in your pjs! I’m bedridden right now because of back surgery, but next winter I won’t be and so I’m making a bucket list for things I want to do next winter, that I’m missing out on this year. I have never tried dog sledding. This sound like a lot of fun. Thanks for the list! So many fun activity ideas. I’m in Vancouver and we got a little bit of snow around Christmas -which was a surprise – but that was it! 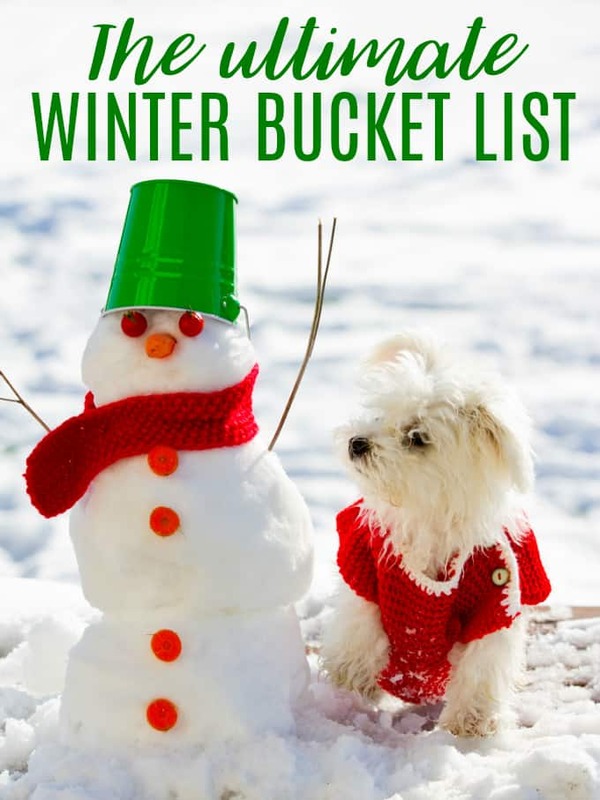 I’d love to be able to go tobogganing soon though..
Great list–but I don’t think I’d ever do a polar plunge! Great list! My goal this year is to try ice fishing, but it has been so freaking cold that I have been apprehensive about giving it a shot. I agree that dog sledding should be tried at least once. I’ve done it in the mountains and I’d like to do it again. I would also like to try the snowshoeing. This is an awesome list you’ve done but I’ll be honest and just say that the “Embrace the indoors” in more my speed. I wish we had snow here! It’s supposed to “snow” here tonight but I doubt we’ll have any. Definitely no more than an inch though. A few of these might be fun, but a winter escape to somewhere warm would be the best idea. Great ideas. The picture of the dog and snowman are so cute. I Embrace the indoors!!! 30 years ago I did many of the outdoor things, but my old body doesn’t like the cold anymore.